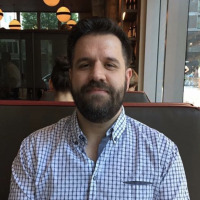 After writing yesterday’s article about creating a shortcut to the Safely Remove Hardware dialog, a number of readers mentioned to me that they’d like create a shortcut to immediately eject a specific drive, so we’ll cover that here. 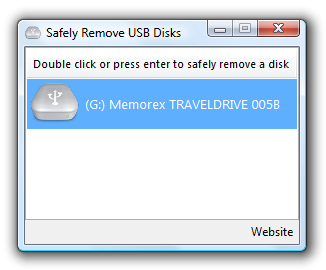 Using the built-in Windows dialog is more powerful and probably would suffice for most people, but for those of us that want complete control there’s a small freeware utility called USB Disk Ejector. 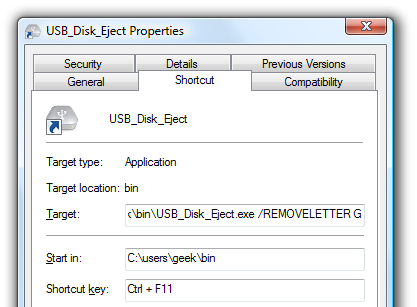 Note: This utility only works for ejecting USB devices, so if you need to eject another type of device you’ll have to use the Windows method. 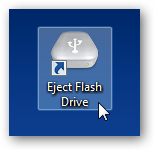 This utility is really quite slick… launch it and then either double-click or press enter on the usb device you’d like to eject. There’s literally nothing else to it. If you assign a hotkey to the executable through a shortcut, you can operate the entire thing from your keyboard. Quite useful for keyboard ninjas! You can also use the utility from the command line, and pass parameters to tell it which drive to eject. It will work silently by default, so there won’t be any popups to deal with. You can also use the partial name matching if your USB drive seems to change letters a lot, but the syntax is slightly strange. To check for a partial name, append * to the beginning of a keyword. Do Not put a second asterisk in the search string, as it won’t work. Note: the /showeject parameter didn’t work for me at all under Vista, but it might work for you. Now that we know how the syntax works, we can include that into a shortcut that can be launched from an icon or hotkey. Right-click on the desktop or elsewhere and choose New \ Shortcut. 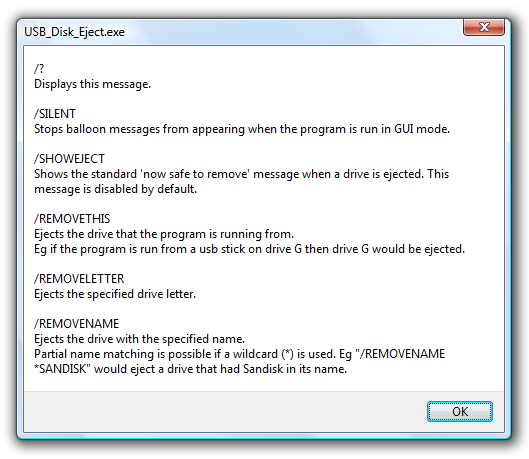 In the location box, you’ll put the full path to the USB Disk Eject application file, and then append the /removeletter parameter to the end including the drive letter. Note that you could use the /removename parameter instead if you choose. Add in the shortcut key and close the dialog. As long as the shortcut is on your desktop you shouldn’t have to restart anything for the hotkey to work. You can also move the shortcut to another folder, for instance your quick launch bar. Tip: If you add the shortcut to the Windows Vista quick launch bar, you can use the built-in hotkeys instead of bothering to assign one manually.